Chelsea manager Maurizio Sarri got off to a winning Premier League start as new signing Jorginho slotted home coolly from the penalty spot in a 3-0 win at Huddersfield on Saturday. Tottenham also made light of discontent over their lack of summer transfer activity by resisting a late Newcastle onslaught to win 2-1 at St. James’s Park thanks to goals from Jan Vertonghen and Dele Alli. Watford, Bournemouth and Crystal Palace also picked up 2-0 wins on the opening weekend of the season. Chelsea have endured a turbulent pre-season with Sarri sworn in to replace fellow Italian Antonio Conte less than a month before the campaign got underway. The Londoners also smashed their transfer record and set a new world record fee for a goalkeeper in splashing 80 million euros (£72 million, $92 million) on Kepa Arrizbalaga this week after Thibaut Courtois departed for Real Madrid. But the young Basque ‘keeper was rarely troubled in recording a clean sheet as the visitors’ greater quality told at the John Smith’s Stadium after a slow start. Crucially Chelsea have held onto Eden Hazard, but while the Belgian was only deemed fit enough for a place on the bench following his World Cup exertions, N’Golo Kante was thrown straight into the side after starring in Russia for world champions France. Kante has been deployed in a more advanced role due to Jorginho’s arrival and was on the end of Willian’s cross to open the scoring 11 minutes before half-time. Moments later Marcos Alonso was upended inside the area and Jorginho cheekily slotted home after a hop in his run up wrong-footed Ben Hamer. 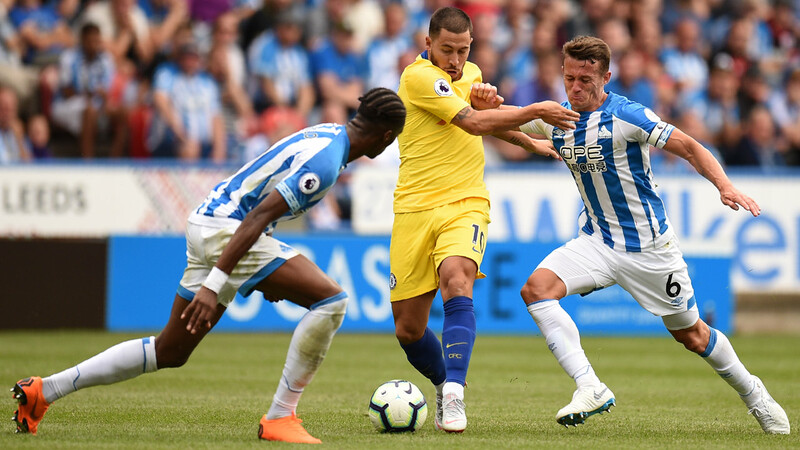 Hazard was introduced for the final 15 minutes and looked keen to make up for lost time as he teed up Pedro Rodriguez to round off the scoring. Tottenham have had a much quieter summer after becoming the first Premier League side since the transfer window was introduced in 2003 to not make a single signing. Supporters’ groups have demanded answers from chairman Daniel Levy after paying increased season ticket prices for a first season in the club’s new stadium. But manager Mauricio Pochettino has insisted his happy just to have retained a host of players who excelled at the World Cup and it was two of them who handed Spurs all three points at Newcastle. Vertonghen and Alli struck either side of Joselu’s equaliser for the Magpies with all three goals coming in the first 18 minutes. “It is important to be strong from the beginning and have belief and convey a positive message,” Pochettino said. Harry Kane was one of Tottenham’s many World Cup stars to start despite having just a few days’ pre-season training in their legs. The Golden Boot winner was unable to break his hex of failing to score in August and, like the rest of his side looked far from his best, but Pochettino was impressed by his side’s commitment and energy levels. “I am so proud of the performance in the circumstances,” added Pochettino. Promoted Fulham earned rave reviews for their summer business, outspending Manchester United and Manchester City, in signing 12 new players. But there was no instant return on that investment as Jeffrey Schlupp and Wilfried Zaha scored either side of half-time to give Palace a 2-0 win at Craven Cottage. Roberto Pereyra scored twice as Watford were too good for Brighton. Bournemouth were also comfortable victors over promoted Cardiff thanks to goals from Ryan Fraser and Callum Wilson.